For the numerically inclined, finance is a world full of tantalizing opportunity. You’ve undoubtedly seen examples of the lavish lifestyles Wall Street-types enjoy in films or on television; but what does a finance career look like in the “real” world. Unfortunately, not everyone is going to be a hot shot on the trading floor — so what jobs can you get with a finance degree? This article will help you get a better idea of the practical careers in finance that align with a degree in the field and the qualifications you’ll need to land one of these impressive roles. Earning a degree in finance is certainly not a dead end. 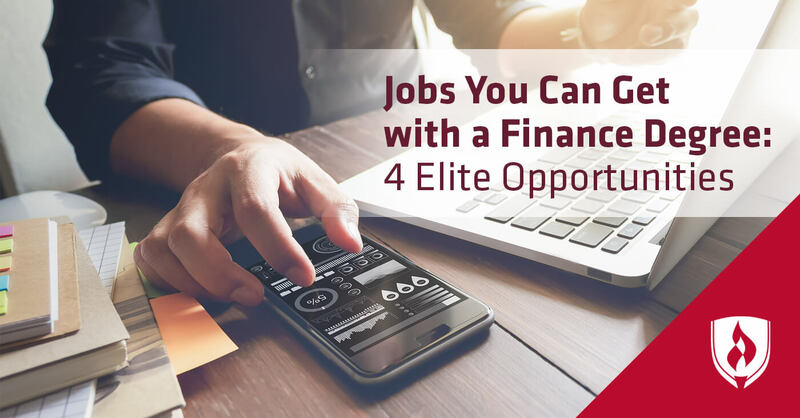 Read on to learn more about four desirable jobs in finance that could be yours with the right training and education. Preferred qualifications: A bachelor’s degree is commonly required for entering this field. 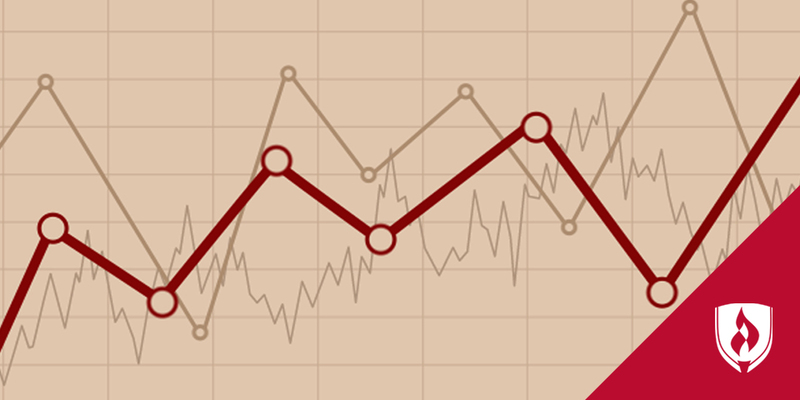 Recommended majors include accounting, finance, economics or statistics. Financial analyst in-depth: Individuals, businesses, non-profit organizations and governments employee financial analysts to gather and dissect financial data and guide their investment decisions. Financial analysts look for market trends and investment opportunities while using formulas and statistical analysis to calculate risk and potential outcomes. In this role you’ll need to have a strong understanding of statistics and a knack for interpreting data into practical investment advice. Preferred qualifications: A bachelor’s degree in finance, accounting or a related field with several years of experience working in the field. Addition credentials such as the CFA or an MBA are also recommended. Financial manager in-depth: Financial managers work in roles that are primarily responsible for the overall financial health of an organization. The specific roles performed by these professionals will vary, but duties like preparing financial statements, managing employees within the department, reviewing financial reports and documents, analyzing market trends and assisting senior management with important business decisions are common. Candidates will need significant experience and a strong educational background when applying for these positions. Upper-level financial management positions like chief financial officer, controller, or treasurer have a large influence on the direction of a business or organization. Fortunately for those in these positions, the responsibility that comes from such an influential role means financial managers typically earn substantially more than analysts. Preferred qualifications: A bachelor’s degree in finance or accounting is recommended. You may also need to earn different licenses or certifications that may be required by the SEC in order to manage client investments. Personal financial advisor in-depth: Personal financial advisors are probably the most identifiable finance professionals — and with an impressive 30 percent projected job growth that appears unlikely to change. Personal financial advisors help individuals plan financial goals and review options for investments such as retirement and life insurance. One major differentiator for this finance job is the sales-focused nature of the work — personal financial advisors need to possess strong interpersonal skills to build a base of clients. While that may require some extra work; success leads to increased earning potential. Preferred qualifications: A bachelor’s degree with a major in finance, accounting, economics or business. Advanced positions generally require an MBA. Professional licenses such as the Series 7 or additional certification may also be required. Financial services sales agents in-depth: Pretty much any movie about Wall Street features a hectic scene of sales agents working at a breakneck pace, shouting on the phone with off-screen investors as they try to process transactions. While these portrayals may be a bit exaggerated for dramatic effect, the gist of their work is shown correctly. Professionals in this field buy, sell and trade commodities on behalf of clients. If working in an investment banking role, these professionals look to secure capital for clients by finding buyers for bonds or stock. An understated aspect of these positions is the reliance on computer models to assist with analysis and to complete high-frequency trades. Because of this, many finance positions require a strong understanding of advanced mathematics and computer science. How can a degree in finance prepare you for these positions? Now that you’ve learned a bit about some common jobs you can get with a finance degree, you may be curious about what exactly a degree in finance entails. The job overviews above have given you a taste of the variety of job duties associated with different careers in finance, but much of the fundamental knowledge needed to succeed stems from the same basic subject matter. While earning a degree in finance, you can expect to gain the basic knowledge and skills to succeed in today’s financial market. From learning how to evaluate an institution’s financial policy and detecting fraud in financial statements, to understanding business laws and examining moral and ethical issues that arise in business, you will develop the skills necessary to fulfil your job duties. While the curriculum will vary depending on the school, most finance degree programs will provide you with the knowledge and hands-on training needed to develop the skills listed above. You likely have a much better understanding of the different types of jobs you can get with a finance degree and are excited to hit the ground running. Just remember, it won’t be easy — these are highly sought-after positions. If you think you have what it takes to make it in finance, check out Rasmussen College’s finance degree program to learn more about how you can get your start in this exciting field. Finance vs. Accounting: Which Degree is Right for You? 1Salary data represents national, averaged earnings for the occupations listed and includes workers at all levels of education and experience. This data does not represent starting salaries and employment conditions in your area may vary. EDITOR’S NOTE: This article was originally published in December 2013. It has since been updated to include information relevant to 2017.